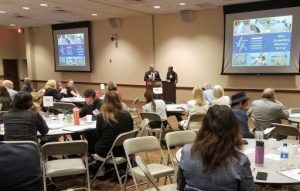 Representing the full spectrum of stakeholders – governmental, business, community, labor, nonprofit and academic – attendees were inspired, challenged, congratulated, and exhorted to stay the course of working to upgrade New Jersey’s inadequate water infrastructure and to help grow the movement. Participated in interactive activities to help grow and apply their knowledge of One Water. Click on the agenda sections below to learn more about the presentations and discussion outcomes from the event. For more event photos, materials, and coverage click here. DEP Deputy Commissioner Debbie Mans asks other DEP staff to stand and invites the membership to contact them with questions. Jane Kenny, co-chair of JWW, introduced a longtime friend and founding member of the collaborative, DEP Deputy Commissioner Debbie Mans. Debbie spoke about One Water, reinforcing the concept as a sustainable, holistic solution to New Jersey’s water challenges, and noted that the public will see increased collaboration between DEP and the Legislature through the governor’s office to help ensure common-ground solutions with multiple benefits. DEP will be speaking to permittees about ensuring more meaningful public participation in a more timely fashion because concerns were raised about the public participation process reports that are part of the Long-term Control Plan process. DEP is looking for ways to improve the public participation process; for example, by speaking more publicly at events like the Membership Meeting so the public knows it’s a policy priority for the agency. DEP is running the gambit, from ensuring compliance with federal standards to having larger looks at some of the programs that haven’t had holistic reviews in a while. DEP is looking at the whole suite of perfluorinated compound contaminants and how to identify sources and reduce their quantitiess to sources along with possible consumption advisories. NJ is one of the leading states in the country on this issue and DEP sees addressing emerging contaminants as a priority. DEP is hoping to propose a green infrastructure rule in the fall with a concurrent commitment to include stakeholders. DEP has been working closely with the sponsors of the stormwater utility legislation and testifying before the Legislature in favor of it. DEP is stressing the asset management component, and looking at how it can be promoted across more than just the drinking water systems currently regulated. DEP has not yet created rules, but it is working with regulated entities to keep them informed on upcoming milestones and how to proceed, including on their asset management plans, which are due April 19, 2019. Strategic stakeholder meetings at DEP will start in the early fall, and those with a desire to participate should speak with Chelsea Brook from the DEP Division of Water Supply and Geoscience. DEP is working on the issue with other agencies, including the Department of Community Affairs and the Department of Health, to address the contamination in the water, paint and other materials. Assemblywoman Nancy Pinkin speaks with Larry Levine, member of the JWW Steering Committee, and Brenda Toyloy, supporting member of JWW. 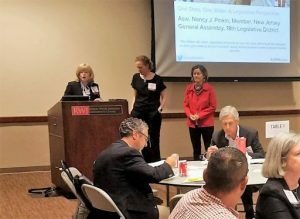 Assemblywoman Nancy Pinkin, who chairs the Assembly Environment and Solid Waste Committee, spoke about New Jersey’s mounting obligation to update the state’s water infrastructure and to provide all New Jersey residents with clean drinking water. “By investing in cleaning up our water, we are investing in the health and prosperity of New Jersey,” she said. Asw. Pinkin (left) and DEP Deputy Commissioner Debbie Mans (center) answer questions from the membership. Over the past several months, the New Jersey Legislature has advanced a number of bills aiming to improve the quality of our drinking water and access to safe water. As the chairwoman of the Environment and Solid Waste Committee and as an outspoken advocate for environmental issues, Asw. Pinkin oversaw the advancement of many of these bills. Video footage of Asw. Pinkin’s remarks here. Chris Daggett, who is retiring at the end of August 2018 from his post as president and CEO of the Geraldine R. Dodge Foundation, receives a beach towel in honor and recognition of his support of JWW. Jane Kenny introduced Chris Daggett, president and chief executive officer of the Geraldine R. Dodge Foundation, as one of the founding members of JWW. On behalf of the collaborative on the occasion of his impending retirement, she surprised him with a beach towel as a token of gratitude for his foundational support for the collaborative and steadfast faith in its mission and ability to succeed. In his remarks, Chris discussed the Jersey Shore’s history of debris wash-ups and beach closures – the result of CSOs. If we’re going to upgrade these systems, he said, we have to row in the same direction – it’s not just CSOs, it’s drinking- waste- and stormwater too. A major point that he stressed was the importance of breaking down silos and tackling water issues from a systems, or One Water, approach. In roundtable discussion, members share and discuss current One Water projects in NJ. 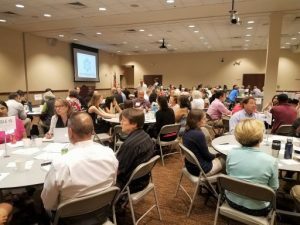 He then led attendees through an exercise at their tables that asked them to talk about a project, either current or upcoming, that exemplified the concept of One Water. Each table decided on the project they would share with the larger group and Chris Daggett reported out the written responses. Read about those projects here. Dan Kennedy and Shoshanna Page, members of the JWW Steering Committee, review the collaborative’s ongoing work and accomplishments over the past year. One of the highlights of the meeting was a review, presented by Steering Committee members Dan Kennedy of the Utility and Transportation Contractors Association and Shoshanna Page of the New Jersey Urban Mayors Association, of everything the collaborative and its committees are working on this year and have accomplished in the past year. Membership in the collaborative has grown to over 400 from more than 175 organizations. 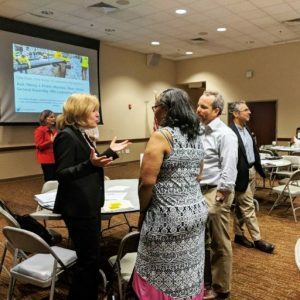 A community survey on water, infrastructure, and the environment conducted by JWW and New Jersey Future is providing the collaborative with a baseline of what New Jerseyans know and don’t know about the state of their water systems, what their concerns are, and what is most important to them. 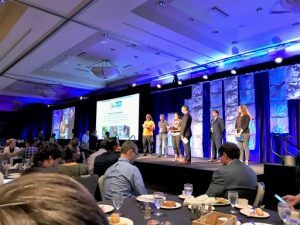 The inaugural One Water Awards program honored four programs and projects in New Jersey that exemplify holistic water resource management. It has expanded its partnership in 2018. The Asset Management and Finance Committee is developing a set of key indicators for measuring the conditions of water systems, the status of asset management programs, and capital investments for water systems. The committee is now talking to the DEP about using the metrics as the agency implements the Water Quality Accountability Act. The Education and Outreach Committee is developing an information “cheat sheet” for news media that provides facts, figures, and survey results, to contextualize systemic water infrastructure issues for reporters. The Green Infrastructure Committee is working with DEP and the Department of Transportation to improve their rules, regulations, and guidance to maximize the implementation of green infrastructure in communities, as a way to address flooding, polluted waterways, and lack access to parks and green spaces. The Combined Sewer Overflow Committee is working to ensure that municipalities and utilities engage their public to develop CSO plans that meet or exceed permit requirements, are affordable, and provide multiple community benefits. By 2020 municipalities and utilities will develop Long Term Control Plans to meet the requirements of the Clean Water Act. JWW members at the One Water Summit announce their commitment to help build support for water infrastructure investments in NJ. Elevating water infrastructure issues through member publications including New Jersey Business Magazine and NJ Municipalities. Dan and Shoshanna stuck to the meeting’s focus of One Water, building upon what prior speakers had said by sharing examples of JWW members who are One Water leaders. The pair said it would be impossible to capture every example in a limited time, and they gave specific recognition to the One Water leadership exhibited by officials at all levels of governments. Stretching and conserving water supplies through reuse, conservation, and innovative partnerships. Dan and Shoshanna thanked all the committee members and individual collaborative members who had given of their time and expertise to help make these accomplishments possible, and urged everyone in attendance to get involved with the collaborative in whatever ways then can. With a thorough review of the One Water concept, attendees were ready to put what they learned into practice by joining committee members at one of four breakout workshops: Asset Management and Finance, Green Infrastructure, Education and Outreach, and Combined Sewer Overflow. 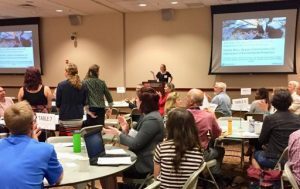 The four committees, which last met in April and May, welcomed those interested in becoming members, reviewed their workplan projects, and brainstormed how they would execute next steps through a One Water lens. Read the outcomes here. Attendees also made it their personal responsibility to advance One Water in their personal and/or professional settings by documenting specific commitments on postcards, which were collected and which they will receive back by mail at the end of the year. Thanks to Dan Kennedy and Shoshanna Page, attendees left the meeting with a suite of options for ways to get involved, or stay involved, in the work of the collaborative. Regardless of area of interest, there was at least one way every attendee could take action. 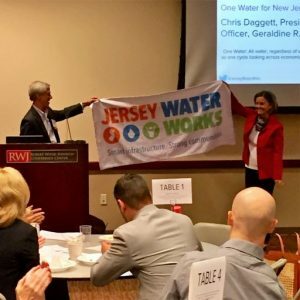 Jane Kenny thanked all for coming and closed the meeting, reminding everybody that the fourth annual Jersey Water Works conference will take place on Friday, December 7 in Newark at the New Jersey Performing Arts Center.